*Liberals who had been disillusioned with Barack Obama’s performance in last week’s presidential debate had every right to be a discouraged leading up to the Vice Presidential debate last Thursday. Their candidate had taken a hit. Romney had changed the tenor of the campaign. The polls tightened (although not by an enormous margin, as the great Nate Silver of the New York Times points out here). Worse of all, on paper, this debate looked like a clear mismatch. The Democrats had their lovable, but gaffe-prone VP Joe Biden, everybody’s happy grandfather, against the young darling of the right wing – the Ayn Rand-loving, perpetually buff Midwesterner Paul Ryan. Old versus young, goofy versus gracious, winding-down versus rising star – it was a study in contrasts (The Onion had a lot of fun with this, painting Biden as a hard-drinking aged frat boy and Ryan as a pure masochist). So, by all rights, it should have been a TKO for Ryan, and another surge in momentum for the Republican ticket, right? Well, as Lee Corso says every weekend on ESPN’s college football coverage, Not so fast, my friend. Biden was on his game on Thursday night, giving the kind of loose, aggressive performance that Obama should have given a week before. He was terrific, and he made the golden-boy Ryan look not-ready-for-primetime. Is it going to have a huge impact on the race? Probably not. It is the Vice Presidential debate, after all. It’s the debate between two people for a job that inspired an HBO sitcom (actually, a really great one). 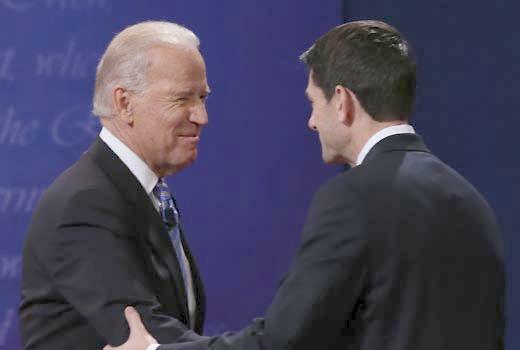 However, Biden provided a big boost to the suddenly-struggling Obama campaign just by showing some fire and steamrolling over the bluster of the Romney-Ryan ticket. It’s the roadmap to electoral success, and it’s one Obama should follow in tonigh’s second-round of debates.